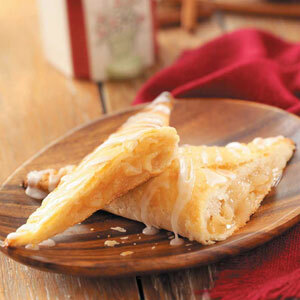 These traditional apple turnovers are tender and flaky, with apple pie-like filling and a thin, white glaze. I freeze the extras and warm them up in the microwave. They're great with coffee. In a small bowl, combine flour and salt; cut in 1/4 cup butter until crumbly. Gradually add water, tossing with a fork until a ball forms. On a lightly floured surface, roll dough into a 12-in. x 6-in. rectangle. Cut remaining butter into thin slices. Starting at a short side of dough, arrange half of the butter slices over two-thirds of rectangle to within 1/2 in. of edges. Fold unbuttered third of dough over middle third. Fold remaining third over the middle, forming a 6-in. x 4-in. rectangle. Roll dough into a 12-in. x 6-in. rectangle. Repeat steps of butter layering and dough folding, ending with a 6-in. x 4-in. rectangle. Wrap in plastic wrap; refrigerate for 15 minutes. Roll dough into a 12-in. x 6-in. rectangle. Fold in half lengthwise and then widthwise. Wrap in plastic wrap; refrigerate for 1 hour. Bake at 450° for 17-22 minutes or until golden brown. Remove to a wire rack. Combine glaze ingredients; drizzle over turnovers. Serve warm. Yield: 4 servings.